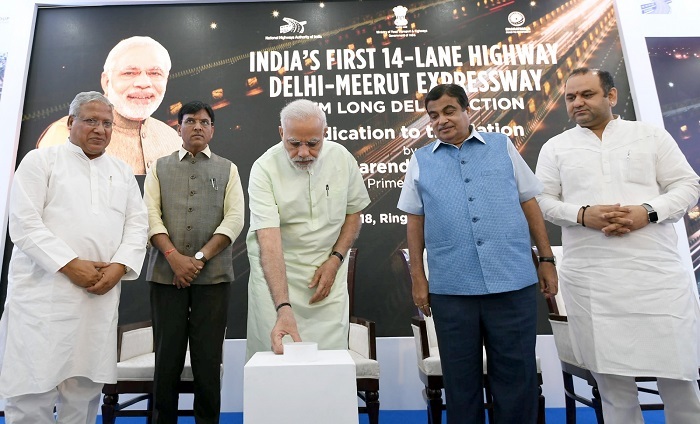 Prime Minister Narendra Modi recently inaugurated two key expressways- the 14-lane Delhi-Meerut Expressway and the Eastern Peripheral Expressway. While the former is reportedly going to reduce the travel time between Delhi and Meerut, the latter would help reduce pollution in the National capital. Transport Minister Nitin Gadkari was also present with the Prime Minister during the occasion. Soon after the inauguration, PM Modi also carried out a road show and then addressed the public of Baghpat, which is close to Kairana where assembly elections were held today. • The 14-lane Delhi-Meerut Expressway is a project worth INR 7500 Crores that will reduce the commute time between two cities from 2 and a half hours to just 40 minutes. • This Expressway will do away with the 31 traffic signals that are built on Delhi-Meerut road. PM Modi referred to this expressway as the “road to freedom from pollution”. • It’s 9 km stretch from Delhi’s Sarai Kale Khan to UP Gate would reduce traffic congestion on roads leading to Noida and Ghaziabad. • The total length is 82 km out of which 27.74 km will be 14-lane while the remaining part will have 6 lanes. • The Eastern Peripheral Expressway is India’s first smart and green highway that is built at the cost of INR 11,000 Crores. • With a length of 135km, the expressway has signal-free connectivity between Ghaziabad, Greater Noida, Faridabad, and Palwal. • Its foundation stone was laid by PM Modi in 2015 and it has been built in 17 months. • As per the reports, the expressway will divert 50,000 vehicles a day and around 2 lakh commercial vehicles will ply without entering Delhi which in turn will decongest the city and is expected to reduce pollution by 27%. • The 6-lane highway is India’s first highway to be lit by solar power and has provisions for rainwater harvesting. It will also showcase 36 national monuments and 40 fountains. • The interchanges have been developed with beautiful architecture and nearly 2.5 lakh trees have been planted on both sides of the highway. The replicas of monuments like Gateway of India, Lal Quila, India Gate, Hawa Mahal, and Ashok Chakra have been carved on the architectural pieces.